Something about the combination of lemon, ginger, and pecans really works for me. I mean, I like them all alone, but all three in a dessert that also features buttery crust — most excellent. 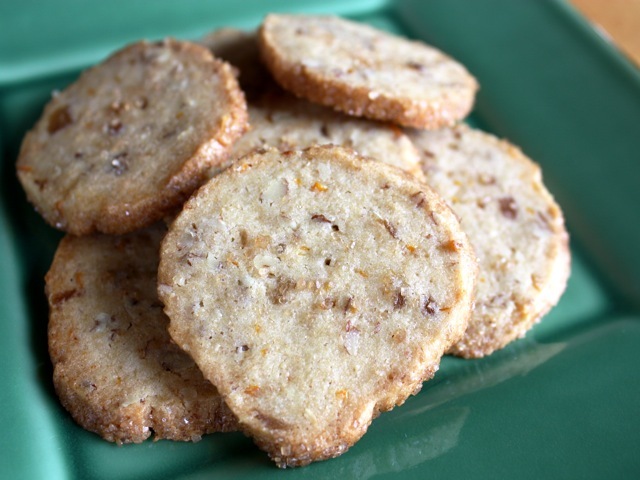 These cookies are a mishmash of recipes by Ina Garten and Amanda Hesser, and they're also quite similar to the thicker, blockier Hazelnut Ginger Shortbread. The name "sandies" is a literal translation of the French "sablés," and refers to the crunchy, sandy texture of the cookies. Serve them with a cup of hot tea or a glass of dessert wine. In a medium bowl, stir together the flour, baking powder, and salt; set aside. Put the softened butter into the bowl of a stand mixer fitted with the paddle attachment and beat until the butter is light and creamy. Add the sugar slowly, first the powdered sugar, then the granulated sugar, beating for a few minutes after each addition. Add the egg yolks, one at a time, mixing briefly after each one. Add the lemon zest, mixing just to combine. Turn down the mixer speed to low and gradually add the flour mixture. When the flour is just incorporated, add the ginger and pecans. Turn off the mixer and remove the bowl; scrape up any unmixed batter from the bottom of the bowl and mix it in quickly by hand. There are two ways to prepare the cookies for baking: slicing thin circles off the logs, or rolling out the dough and using cookie cutters. If you choose the faster slicing method, use a serrated knife to slice the logs into thin, ¼-inch-thick circles. Arrange the cookies on the prepared baking sheets and, if you wish, sprinkle raw sugar over each cookie. Lightly press the sugar into the cookies with your fingers. If you choose the fancier cutter method, roll out the dough on a lightly floured board to a thickness of about ¼ inch, then use a cookie cutter (fluted squares are traditional for sablés) to cut out the cookies. Arrange the cookies on the prepared baking sheets and, if you wish, sprinkle raw sugar over each cookie. Lightly press the sugar into the cookies with your fingers. Bake for 12 to 15 minutes, rotating the sheets halfway through, until the tops of the cookies are golden and the edges are browned. You don't want to overbake these cookies, but underbaking them makes for doughy, floury-tasting cookies. The browned edges indicate the cookies have attained the proper crunchy texture. Let the cookies cool for a few minutes on the sheets, then remove to racks to cool completely. You can eat the cookies fresh from the oven, but their taste and texture actually improve with age, so if you can stash them in a cookie jar for a day or so, you'll be rewarded. You can replace half of the flour with whole-wheat pastry flour, if you like.